Two key characters from Shanna Hatfield’s historical series, Baker City Brides, visit us today. Set in the western town of Baker City, Oregon, this series of sweet romances highlights determined women and the men who fall for them in the 1890s. Welcome Mr. and Mrs. Jordan. Tell us a little about how you met. Thane: Jemma’s sister, Jane, was married to my brother, Henry. Upon Henry’s death, I traveled to England to settle his estate and discovered I had a niece and nephew. They lived with Jemma. She’d taken care of them both, even before Jane passed away giving birth to Lily. Jemma: Little did I know when this cowboy showed up on my doorstep that he’d turn my world all topsy-turvy. In order to travel back to his ranch together, we wed a few weeks after his arrival. So you married a complete stranger? Jemma: Not willingly. (Grins at Thane) He inherited the children and I couldn’t bear to be separated from them. The only way for me to stay with them and not create a scandal was to wed this scoundrel. Thane: (Kisses Jemma’s cheek) She was the most annoying, irritating, stubborn, opinionated female I’d ever met. She also happened to be the most beautiful. Jemma: (Blushes and squeezes Thane’s hand) Despite his ability to infuriate me beyond reason, he really does say the nicest things. Tell us what it’s like living on the ranch. Thane: It’s a little slice of heaven. We’re about an hour from Baker City, to the south. We have rolling hills full of fat cattle and a good crew that keeps everything running smoothly. I also raise and train horses. Jemma: He forgot to mention we live in a tiny little cabin barely big enough for our dog much less two adults and two lively children. There isn’t a drop of running water. The worst thing is the abominable shack we must use that serves our personal needs. (Jemma shudders) It’s positively detestable. Thane: (Smirks) What my lady refers to as an abomination is our outhouse. It’s just a part of life where we live. What’s the most exciting thing happening right now? Jemma: (Glances at Thane and smiles) Thane is building our new home with running water and honest-to-goodness bathrooms. I can hardly wait until it’s finished. Thane: I caught her crying over the bathtub we installed the other day. She was sobbing about how pretty it was and how much she loved it. I’m pretty sure she holds a greater affection for the bathtub than me. Jemma: I did no such thing and you know it. (Swats Thane’s arm) Why, that’s utter nonsense. I merely stated how wonderful it would be to soak in a real tub with water that didn’t have to be heated and hauled. My gracious, Thane Jordan! Thane: (Leans toward interviewer and speaks in a whisper) See why it’s so much fun to ruffle her bloomers? (Sits back up and winks at Jemma) The other exciting tidbit is that our lumber supplier has gone daffy for one of our good friends, but Maggie’s running away faster than he can catch her. Jemma: Maggie isn’t nearly as opposed to Ian as she tries to convince everyone. I think secretly she likes him. Thank you for joining us. Any parting words for our readers? Thane: Thank you for hosting us today. If you enjoy sweet romances set in the past, I hope you’ll consider reading our stories in Crumpets and Cowpies and Thistles and Thimbles. Discover more about the Jordan Ranch and life in 1890 Baker City in Crumpets and Cowpies, the first book in the Baker City Brides series. In the story, rancher Thane Jordan reluctantly travels to England to settle his brother’s estate. He quickly discovers he’s inherited much more than he could possibly have imagined, including a niece and nephew he didn’t know existed. The children’s aunt, Lady Jemma Bryan has no desire to spend a single minute in Thane Jordan’s insufferable presence much less live under the same roof with the handsome, arrogant American. Forced to choose between poverty or marriage to the man, she travels across an ocean and America to reach his ranch in Oregon. The second book in the Baker City Brides series releases Thursday, April 9! Maggie Dalton has no need for a man in her life. Widowed more than ten years, she’s built a successful business and managed quite well on her own in the bustling town of Baker City, Oregon. Aggravated by her inability to block thoughts of the handsome lumber mill owner from her mind, she renews her determination to resist his attempts at friendship. Full of Scottish charm and mischief, Ian MacGregor could claim any available woman in Baker City as his own, except the enchanting dress shop owner who continues to ignore him. Not one to give up on what he wants, Ian vows to win Maggie’s heart or leave the town he’s come to love. Lacy, Book 5 in the Pendleton Petticoats series, will be available for pre-orders April 9. Be among the first to order the long-awaited story of Grant Hill. Talk about losing at love… eligible banker bachelor Grant needs to find the right girl. Those attending the party will also get a first look at the cover! Aundy (Book 1) – One stubborn mail-order bride finds the courage to carry on when she’s widowed before ever truly becoming a wife, but opening her heart to love again may be more than she can bear. Caterina (Book 2) – Frantic to escape a man intent on marrying her, Caterina starts a new life in Pendleton, completely unprepared for the passionate feelings stirred by the town’s deputy sheriff. Ilsa (Book 3) – Tired of relying on others to guide and protect her, Ilsa finally finds the strength and courage to take control of her life. Unfortunately, her independence drives a wedge between her and the man she’s come to love. Marnie (Book 4) – After giving up on her dreams for a future, Marnie finds her hope rekindled by one caring, compassionate man and the orphans who need her. Dust off your dancing shoes and choose your formal attire for the Petticoat Ball Party on Facebook April 9, 2015 from 10 a.m. to 2 p.m. Giveaways and games will make for a splendid event as we celebrate the release of Thimbles and Thistles and the debut of Lacy! 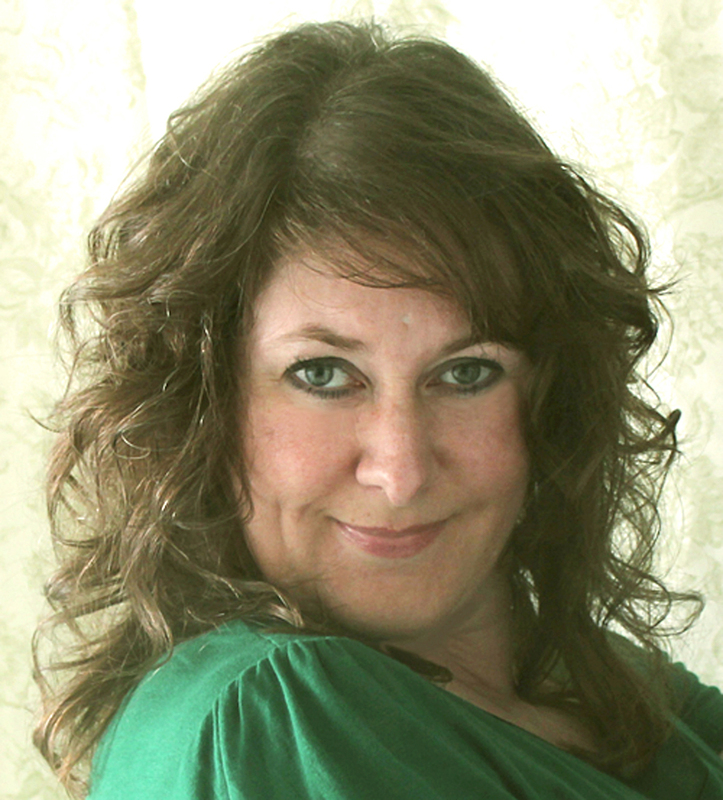 A hopeless romantic with a bit of sarcasm thrown in for good measure, Shanna Hatfield is a bestselling author of sweet romantic fiction written with a healthy dose of humor. In addition to blogging and eating too much chocolate, she is completely smitten with her husband, lovingly known as Captain Cavedweller. What a wonderful treat to be a guest on your blog today! 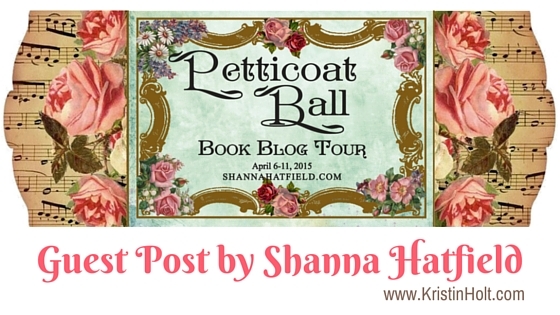 Thank you so much for hosting me and being a part of the Petticoat Ball Blog Tour (and party!). All the best to you!